The simplest way to create and send invoices. Send your invoices any way you like - email or as a PDF attachment. Best of all the whole thing takes less than 30 seconds! 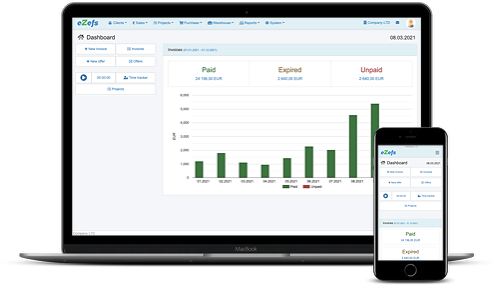 Manage your sales, clients and finances with Ezefs invoicing software. Simple, intuitive and convenient invoicing system. It takes under 30 seconds to create invoices with Ezefs free invoice creator - add a customer, add your product, hit send. Job done! You can submit invoices and monitor company activities from anywhere in the world. You no longer have to go through the office to print out an invoice for the customer you work with. You can also create the required documents directly on the way, or even at the client or partner's office. Cloud service. Invoices and offers. Sending PDF. All companies in one place! "Using this service made our work much easier." "We are very pleased with this service and we sincerely encourage other users." "Clear and comfortable system. Very professional and fast support." "Very convenient to use. Ezefs has increased the speed of generating and sending invoices."